Недавно катающиеся ( Early Intermediate ) : от новичков до тех кто разучивает «водный старт» и умеет кататься в трапеции и петлях. Уверенно катающиеся ( Late Intermediate ) : правильная манера стоять на доске, успешное и радостное катание почти в любых условиях, возможно удовлетворительное умение «фордаков» и прыгать. Первая стадия – это начинающий виндсерфер. Умение подпрыгивать с чопа и с гладкой воды. Далее виндсерфер в своем продвижении специализируется по разным направлениям. Используете трапецию, петли для ног, мачтовый погон и центровку. Лёгкий старт из воды. Завершаете 75% трюков и поворотов. Используете трапецию 75% времени. Иногда используете петли для ног. Имеете в репертуаре глиссирующий фордевинд. Используете трапецию 75% времени. Иногда используете передние петли для ног. Используете передние петли для ног. The second part of the Intermediate course, building on your skills to get the board planing. 1. Die sichere Zuordnung zu einer Könnensstufe fällt schwer, weil keiner so recht zu sagen vermag, ob man ein, zwei oder alle Manöver einer Könnensstufe beherrschen muß, um "dazu zugehören". Mit der Aussage: "Ich bin so zwischen Könnensstufe 3 und 5" kann man aber beim besten Willen nicht viel anfangen. 2. Der Begriff KÖNNEN ist dehnbar. Der eine meint, er kann die Powerhalse, wenn er das erste Mal um die Ecke geschaukelt ist, ohne ins Wasser zu fallen. Der Andere denkt, er kann die Powerhalse nicht, weil Dunki schneller um die Tonne halst als er. Standards for Basic Windsurfing certification are based on the concept that not just safe windsurfing skills should be learned, but that related and important subjects, such as safety and courtesy both afloat and ashore, proper attitude, board preparation, weather, tides and current, basic theory, and the “rules of the road” should be part of the learning process. The following skills are to be tested on the water for mastery. It is recommended that the chronological order of skills be followed as listed. To attain the mastery level, the student should be able to perform the skills safely and generally mistake free – judged on a basis that is appropriate for a learn-to-windsurf student. Criteria used for evaluation should include steering technique, sail trim, stance and grip, board handling skills, and student confidence. Falling or dropping the rig should not, on its own, be used as a criterion for not mastering a skill. Student performance may be influenced by wind speed and direction, water conditions and air temperature. Recommended wind range for testing skills is three to six knots. Regional differences in typical conditions may require that this recommended wind range be modified. 1. Rig a Board: from components, then launch without assistance. 2. Uphaul the Rig: from downwind and from upwind to basic position. 4. Turn Board: from basic position, turn board in opposite direction (180 degrees) through no-go zone. 5. Go to Sailing Position: from basic position to sailing position. 6. Sailing Position: stance, grip, and sail positions for different points of sail. 8. Stopping Maneuvers: slow and quick controlled stops. 9. De-Rig to Self-Rescue: de-rig to self-rescue position and paddle 100 yards. 10. Rig from Self-Rescue: from self-rescue position to sailing position. 11. Tacking: from reach to reach, close-hauled to close-hauled. 12. Jibing: reach to reach, run to run. In addition to mastering the minimum water skills, a student is expected to be familiar with the following knowledge areas: right-of-way, safety, rig parts, board parts, points of sail, hypothermia, heat emergencies, weather, currents and tides. 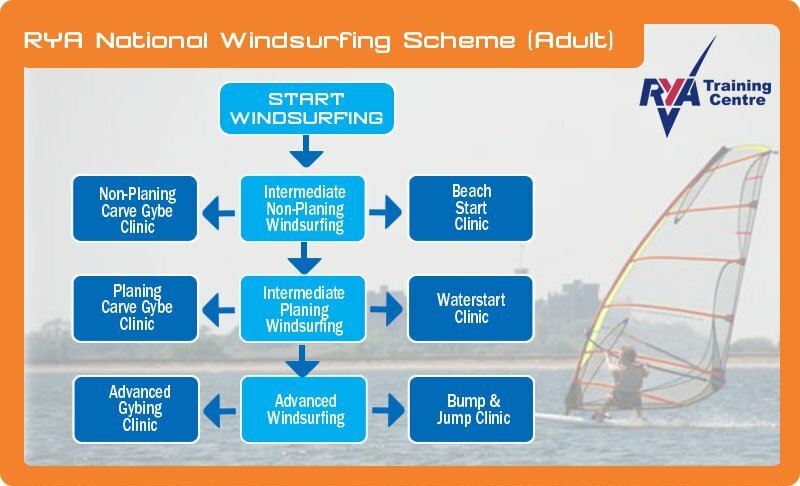 To successfully complete the requirements for a basic windsurfing certificate, you must answer 80% of the questions correctly on the knowledge test that your instructor will give you. 16. Know and understand how a sail works. 18. Know and understand steering a sailboard. 19. Know and understand current effects. 20. Know and understand tidal effects. 21. Know and understand offshore, onshore, and cross-shore winds. 22. Know and understand hypothermia cause. 23. Know and understand hypothermia prevention. 24. Know and understand hypothermia recognition. 25. Know and understand hypothermia treatment. 26. Know and understand finding wind direction. 27. Know and understand finding current direction. 28. Know and understand the Basic Rules of the Road (#1-5). 29. Know and understand the Windsurfing Safety Code. 31. Know and understand the clothing for windsurfing in hot and cold climates."